Unlike standard economics, which applies the concept of distribution exclusively to final outputs, ENL applies it to final outputs, labor, and wastes. The reason for this more extensive treatment is that all three factors can be socially assigned to individuals in ways that significantly affect aggregate health. In other words, they are all subject to maldistribution. An output is perfectly distributed when each unit is consumed by the person who can convert its potential value into the highest possible effectual value. The analogous statement in the present context is that labor is perfectly distributed when each unit of labor time — say an hour — is assigned to the worker who incurs the lowest possible labor cost. If labor cost is negative, this points to the worker who will gain the most health from working this hour. If labor cost is positive, it points to the worker who will lose the least health. Any distribution of labor that does not satisfy this criterion is called labor maldistribution. When dealing with outputs a central concept is consumption capacity — the aggregate ability to transform potential value into effectual value. This capacity depends on the number of consumers and their overall pattern of satiation. The equivalent concept in the labor context is absorption capacity: the aggregate ability to maximize the health effects of labor, or — what amounts to the same thing — to minimize labor cost. This again depends on the number of people involved and their “satiation” pattern. Because the latter term is an awkward fit here, ENL uses the term saturation instead. Like final outputs, labor is subject to maldistribution. This occurs when the next unit of labor time does not go to the worker who is most able to absorb it — that is, to minimize labor cost. 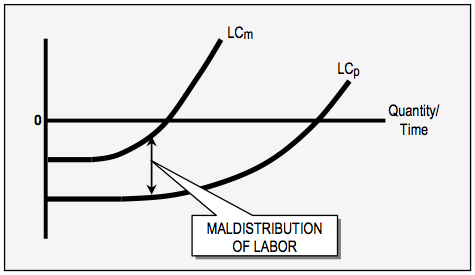 Labor maldistribution is the difference between the LCm (maldistribution) and LCp (perfect distribution) curves. The bottom curve, labeled LCp, reflects perfect distribution for labor — in this case for labor that is of high quality (largely negative cost). Each labor unit is performed by the worker who can maximize the labor's health effects. The flat portion of the curve is relatively long, indicating that the labor saturation point is not reached until well into the work-day. The curve moves gradually upward and becomes positive when the work-day becomes excessively long, thus transforming beneficial labor into labor that is detrimental to health. The top curve, labeled LCm, reflects the maldistribution of labor and the diminished absorption capacity that results. Analogous to output maldistribution, this modifies the curve in three ways: the flat portion is shortened, the entire curve is shifted upward, and the curve rises more steeply than before. In this case labor cost is still negative when the work-day begins, but this is not necessarily true. If the degree of maldistribution were to increase further, the LCm curve could begin in positive territory, indicating that the health effects of labor are negative from the very beginning of the work-day. As with allocation generally, ENL is neutral regarding the social mechanism used to allocate labor. It is clear, however, that in a rational economy we should carefully consider how labor is assigned, always striving to minimize labor maldistribution and thus to maximize the aggregate health achieved during the work-day.